It is essential for everyone to know their own blood group and that of their family members. There are many occasions when knowing your blood group could be important. For example, if you or a member of your family required an urgent blood transfusion it would be useful to know your blood group in advance. If it was an uncommon group it would allow the hospital valuable time to ensure adequate supplies. The test is accurate and will detect the common blood grouping system A,B,O,AB as shown in the chart below which covers the vast majority of the population. 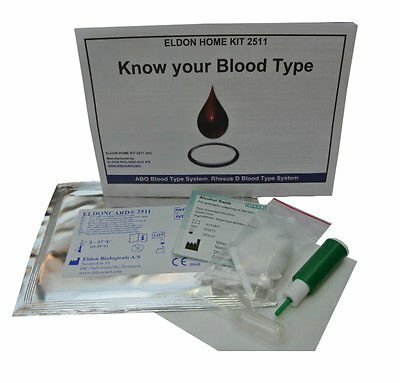 Unusual blood groups or rare sub-types will not be detected by this method. Further investigation by a blood transfusion laboratory will be necessary to identify such groups. This blood test will determine which of the main 8 blood types you are. Once you have determined your blood type you will know which other blood you can accept and also who can accept yours. For example in the chart below if your blood type is O- (negative) then you are known as the universal donor as all the standard blood types can receive your blood but you can only be given O- in a transfusion. On the other hand if you are AB+ (positive) then you are known as the universal recipient being able to receive any of the standard blood types but your blood can only be used in a transfusion by someone having the same blood type i.e AB+ (positive). The chart below shows all the combinations possible. Can this test be used to determine parentage? Not exactly as there are a number of blood types that could result from the blood types of the mother and father. However there are a limited number of combinations. Once you have determined the blood type of the mother, father and child it is possible to limit the number of options. The two charts below make this clearer. For example in the first chart if the father's blood type is O and the Mother's type is also O (nearly half the population is type O) then the child must have type O blood. On the other hand if the child is type A (around 40% of the population) and the mother is type O then the father must be type A or type AB as shown in the second chart below.